Summer is here which means one thing for seasonal allergy sufferers – uncomfortable symptoms such as watery eyes, itchiness and constant sneezing. Just like human hay fever sufferers, dogs experience their fair share of seasonal allergies which often result in irritation or inflammation of the skin, known as allergic dermatitis. At this time of year, common allergens include pollen, grasses, dust mites, and even mildew and mould. 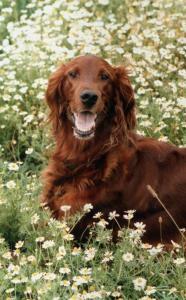 In humans, seasonal allergies usually affect respiration, whereas in dogs, they tend to affect the skin. Allergic dermatitis causes itchiness which is often so uncontrollable that it leads to aggressive itching that damages the skin and coat. Because the itch-scratch cycle is self-perpetuating, it can be difficult to bring under control. If your dog continues to itch itself, the skin can quickly become raw and inflamed. Eventually, this may lead to hair loss and open sores that aren’t given time to heal. Hot spots are areas of inflammation that are repeatedly aggravated, whether through excessive licking or scratching, and they can be difficult to manage once they’ve appeared. Sometimes the aggravation can be so severe that bleeding occurs. Seasonal allergies can also affect the delicate skin in the ear canals, which leaves room for secondary infections to form. If you notice your dog shaking his head or pawing at his ear, there is probably a problem that needs your attention. Discharge or a strong odour will be present if infection has taken hold. Dogs with seasonal allergies can also display generalised redness, including around the eyes, paws and gum line. Puffy eyes and typical signs of sinusitis/bronchitis may show if your dog suffers with allergies particularly badly. Before self-diagnosing an allergy or associated skin complaint, take your dog along to the vet for a thorough check-up. Obviously, seasonal allergies are worse when the weather is warmer and the allergens are out in force. If your dog has pollen sensitivity, for instance, it will be more susceptible outdoors where pollen is abundant in the air and can attach itself to the paws and coat. Without knowing it, your dog then tracks this pollen inside to its sleeping and play areas, where it experiences the same allergic response every time it re-visits them. Dermatologists recommend frequent baths, taken noon and night, to wash away allergens and help keep your home a safe environment. It is important not to over-bathe your dog though, as this can dry out the skin and exacerbate existing problems. Ideally, try and use a grain-free, non-aggravating shampoo. Your vet may be able to prescribe something more suitable, including medicated shampoos and antihistamine creams. Regular foot soaks can also help by removing allergens before your dog has chance to carry them inside. Clean and vacuum as much as possible, especially if you suspect certain areas are harbouring allergens. Diet is another big factor to consider in managing allergies and skin conditions as, often, poor quality diets loaded with cheap fillers like cereals, grains and meat meal, are to blame for perpetual problems that don’t clear up. I have a labradoodle now 8 yrs and she has been getting worse with non flea related itchiness with each and every spring and summer.A friend suggested I try her on a raw meat and raw lamb bone diet with added fresh carrot grated on top and occasional sweet potaoto and lots of oily mackrel and lambs liver raw once a week. I tried it and she has been 75% better her fur has grown back on her head and she is much more content.The vet even noticed her skin was better and asked what I'd done to improve it.All I had changed was her diet from canned and quite expensive rubbish, to real meat that dogs in the wild have survived on very well from the beginning of time. I never ever give her a cooked bone as they'l splinter and can cause horific damage to their mouths and stomaches.I can't understand how pet shops and supermarkets sell bones cooked and even pork bones, which are the worst for a dogs tummy! This sounds the same as what my German shepherd has and the vet has put him on antibiotic's and steroids to calm it down which it has done. Re itchy skin- We have a problem with what I think are called Harvest mites or chiggers depending on where you live. Tiny orange mites ( very hard to see) picked up in fields from July to Sept and causing itchy sores and blisters on feet and legs. Has anyone found a product to help deter this pesky creatures? My best ploy is to scrape them off with a fingernail after each walk but that's not nice on tender skin, then soothe with aloe- which of course gets licked off. If untreated they cause repetitive chewing and all the resulting probs that that causes. They cling on like ticks so just washing soothes but doesn't resolve. The deterrent that I used to use is no longer available so any suggestions much appreciated, thanks. My lab has allergies in September October November , I was in hospital last year when I got home after two weeks he was in a terrible state his back leg was red raw bald and badly infected I took him straight to the vets he was treated with antibiotics and steroids it took a long time to heal, my husband was looking after him and didn't notice .i won't say what I called him ,its strange how he always gets allergies late in the year ok all the rest of the time . Hills Z/D food has helped my dog - recommended by my vet (the cheapest I've found it is on viovet). He used to rip open his paws (if I didn't catch him in time) and cause himself terrible pain. He does it only very occasionally now and has been on this food for over 18 months. He also has a form of irritable bowl (runny stools and trapped wind) and the food has helped that also. One of my Collies suffered from bad skin problems and we had her allergy tested (Â£200) and found she was allergic to grass pollen, beef, wheat and other cereals. Antibiotics and steroids cleared it but we found that a solution of Witch Hazel (50%) diluted with sterile water and sprayed on her skin had a soothing effect and stopped her scratching. I now only give my dogs grain free food - Salmon and Potato (Barking Heads) or Pork and Potato but I and they prefer the fish version. I also think that the fish oils help to keep the skin healthy so I tend to keep to the Salmon. I also occasionally give them Salmon (steamed) from the fish counter at our supermarket when it is on offer - that also helps but I found that Salmon Oil on their food didn't have the same effect. Hope that helps.